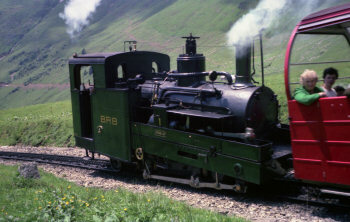 I started building a model of this locomotive somewhere in the mid 70's, most likely 1975-1976. I never finished it. 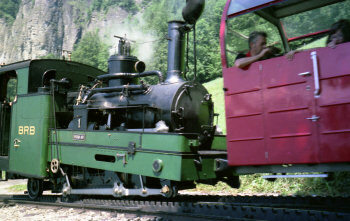 It is a model of the famous locomotives of the Brienz Rothorn Bahn in Switzerland. 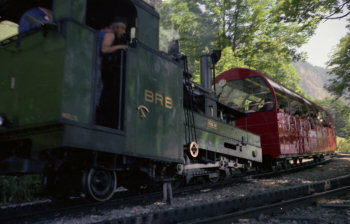 These engines dating back from 1891 provided the main motive power for this line for decades. Today they are rarely seen in service. 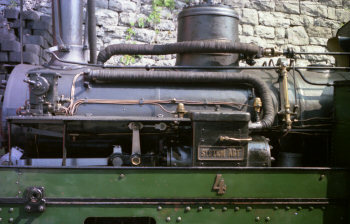 All five engines still exist. The main duties on the line are now done by no's 6-7 (1933 and 1936) and 12-16 (1992 and 1996). Some photo's I made myself in 1977 during a walk along the BRB-line from Brienz all the way to the top. That is roughly a 1800 meter ascend just to be able to make photo's. The model was completely scratch built from brass sheet (0,5 mm). I made every part myself with a jewelers saw, files and and a soldering iron. It is sized to fit 16,5mm rails which means it has a scale of approximately 1:65. I don't remember if I ever intended this model to run but I can see no provision for motor of gearing whatsoever. After abandoning the project the model spent most its life forgotten in a box on a loft. When I picked up railroading again a few years ago I was completely endeared that I still had this loco. I decided to leave in the state I left it over thirty years ago. This model was was seriously damaged in the collapse of my bookshelves in the summer of 2006. It can be repaired though. It is currently awaiting construction. May be this mishap may spark the intiative to complete the model after thirty years! !